As the momentum for Fallout 4 continues to build , a special Fallout beer has been unveiled, with Gaming giant Bethesda joining forces with brewery giant Carlsberg to produce a special beer to mark the launch of Fallout 4. 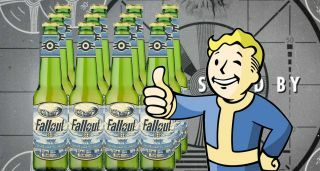 The eagerly awaited next Fallout game is just a few weeks away, and to keep us quenched until then Bethesda has announced an official drink... it's not Nuka Cola, which would have been our first guess but, on the bright side it is alcoholic. You can pre-order a case of Fallout Beer right now on Amazon - although it won't be arriving until November and it's only available in the UK. "This is something of a world-first. Adult participation in video gaming is a truly social activity, on a par with cinema and music, said Bruce Ray, Corporate Affairs Director at Carlsberg UK. "We're proud to work with Bethesda to produce a beer Fallout fans can enjoy". Fallout beer - we're told - is a 4% alcohol by volume (ABV) pilsner lager, with a refreshing zesty hoppy taste and a floral aroma, sold in a 330ml bottle format and sold only to customers aged 18 and over.